Teaching PCs are identical to student PCs. They run Windows 10 with Microsoft Office 2016. If you’ve not used a student PC before, please take a few minutes before teaching to use the PC. The first time you log in, it might take 5 minutes as the PC loads your preferences. It remembers them next time so future logins should be under a minute. Then Sign out (please don't choose Shut down as this delays the next lecturer). Hold down the Windows key (bottom left on the keyboard, with a flag on it) and press the P key. To browse the software on the PC, click the Windows start icon, then All apps. 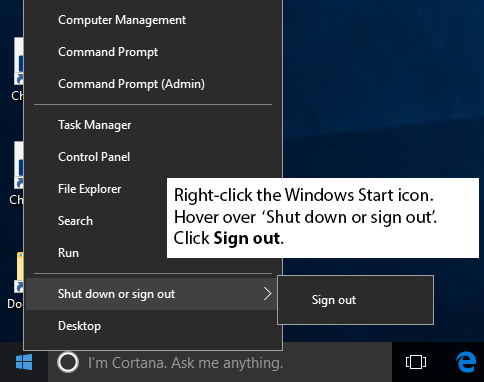 Or use the search box next to the Start menu (labelled ‘I’m Cortana‘). Use this view to show your slides on a projector, while you see them with notes on the monitor. When you've finished, hold down the Windows key and press the P key, then click Duplicate, so it's ready for the next person to use. Smart Ink isn't available because it clashes with KentPlayer.